The Makita 18-volt compact lithium-ion cordless 2-piece combo kit is built for the pro-user who requires best-in-class cordless tools for drilling, driving and fastening in a more compact size. The LCT200W includes a compact and versatile 1/2-inch driver-drill, as well as a powerful impact driver that weighs just 2.8 pounds. 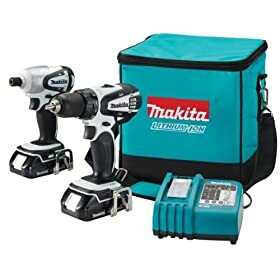 Each tool is powered by Makita's 18-volt compact lithium-ion battery and the ENERGY STAR rated Makita Rapid Optimum Charger. Makita's LCT200W includes a compact and versatile 1/2-inch driver-drill (LXFD01CW). The LXFD01CW features a Makita-built four-pole maximum torque motor that delivers 480 inch-pounds of max torque and 290 inch-pounds of PTI torque in a compact size. The LXFD01CW has a two-speed all-metal transmission that delivers 0-400 RPM in low speed and 0-1,500 RPM in high for a wide range of drilling and driving applications. 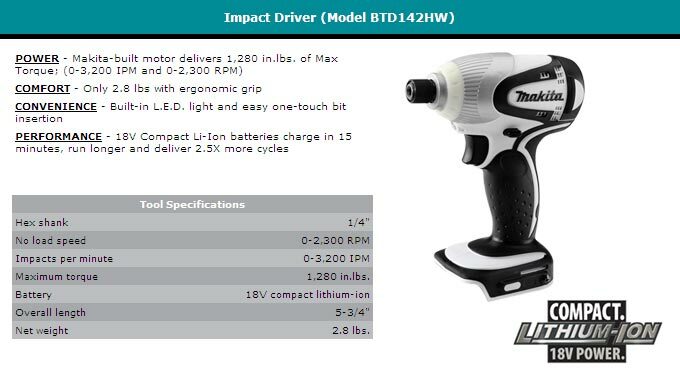 The LCT200W also includes a powerful impact driver that weighs just 2.8 pounds (BTD142HW). The BTD142HW features a Makita-built four-pole maximum torque motor that delivers 1,280 inch/pounds of torque, 2,300 RPM, and 3,200 impacts per minute for a wide range of fastening tasks. Makita's proprietary hammer and anvil impact mechanism is manufactured using the best raw materials with the highest quality steel and unique heat hardening process for maximum fastening and driving power. 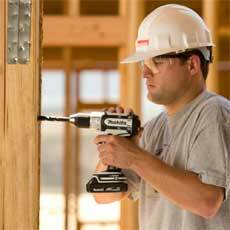 Both the driver-drill and impact driver have a compact and ergonomic shape that fits like a glove for reduced operator fatigue, as well as a built-in LED light that illuminates the work area for more efficient work. The LCT200W includes two 18-volt compact lithium-ion batteries and a Rapid Optimum Charger for increased battery and charging power--and less downtime on the job site. The LCT200W delivers compact cordless solutions for drilling, driving, and fastening. The combination of power and performance in a compact size makes the LCT200W ideal for pro trades including HVAC, plumbing, electrical, remodeling, woodworking, and any pro contractor who requires a best-in-class engineered cordless combo kit. The LCT200W is just another example of Makita's commitment to innovative technology and best-in-class engineering. In addition to their breakthrough 18-volt LXT series, Makita has added 18-volt compact lithium-ion tools for cordless power in a more compact size. Makita's 18-volt lithium-ion batteries and ENERGY STAR rated Optimum Charging System provide several benefits over old battery technology. When compared to traditional 18-volt NiCd batteries, Makita's 18-volt lithium-ion batteries have 40% less weight, longer run time, and five times lower self-discharge to keep cells active and ready to use at any time. 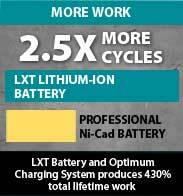 Makita's 18-volt lithium-ion battery delivers 2,000 cycles--2.5 times more than NiCd. In addition, built-in shock absorbing features help protect the battery, and 16 firm-holding contact terminals deliver constant high power. During the charging process, a built-in memory chip in the battery communicates with the Optimum Charger for a more efficient charge, extending the battery life. 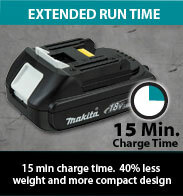 Makita's Optimum Charger charges both 18-volt compact lithium-ion batteries and 18-volt LXT lithium-ion batteries. It will charge an 18-volt compact lithium-ion battery in just 15 minutes, and an 18-volt LXT lithium-ion battery in only 30 minutes. Makita also offers a Rapid Automotive Charger for 18-volt LXT and 18-volt compact lithium-ion batteries that plugs into 12-volt DC sockets equipped in most automobiles and trucks for added mobility. 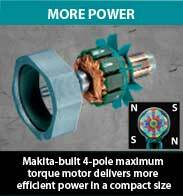 Makita is a worldwide manufacturer of industrial-quality power tools and offers a wide range of industrial accessories. Makita applies leading-edge innovation to engineer power tools that are more compact and energy efficient, yet deliver industrial strength power and results. Makita U.S.A., Inc. is located in La Mirada, California, and operates an extensive distribution network located throughout the U.S. Makita is Best in Class Engineering. Every Makita lithium-ion tool is backed by Makita's 3-year warranty that covers repair due to defects in materials or workmanship up to three years from the date of original purchase. 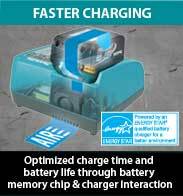 Makita lithium-ion batteries and chargers have a limited 1-year warranty. 1/2-inch driver-drill, impact driver, two 18-volt compact lithium-ion batteries, Rapid Optimum Charger, contractor bag.